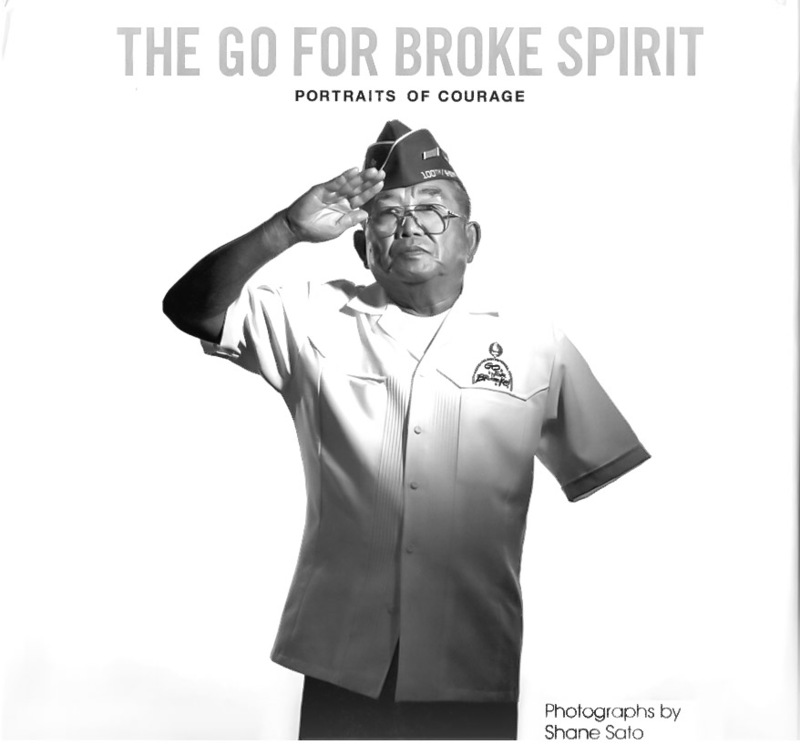 The dust jacket for ”The Go for Broke Spirit: Portraits of Courage,” the new coffee-table book by Shane Sato containing photos of military veterans. Pictured is Don Seki. ‘Portraits of Courage’ was nearly 20 years in the making. In 1999, Shane Sato began what seemed to be a pretty straightforward assignment: shoot portraits of as many still-living Japanese American World War II veterans as possible. According to the preface of the photographer’s newly published coffee-table book “The Go for Broke Spirit,” it began when Christine Sato-Yamazaki and Diane Tanaka of the then-still-nascent Go for Broke National Education Center saw some of Sato’s work —“portraits of ladies in a retirement home” — and asked if he would take portraits of some veterans, which would be used to publicize the Go For Broke Foundation, back in the pre-Little Tokyo days when the GFBNEC had its offices in Torrance, Calif.
Over time, the initial concept — black-and-white photos of veterans of the 100th Battalion/442nd Regimental Combat Team and the Military Intelligence Service wearing their iconic white Go for Broke/MIS short-sleeved shirts and garrison caps — evolved. In part, it was due to technological advances as photographic film gave way to digital and a decision to also shoot in color. 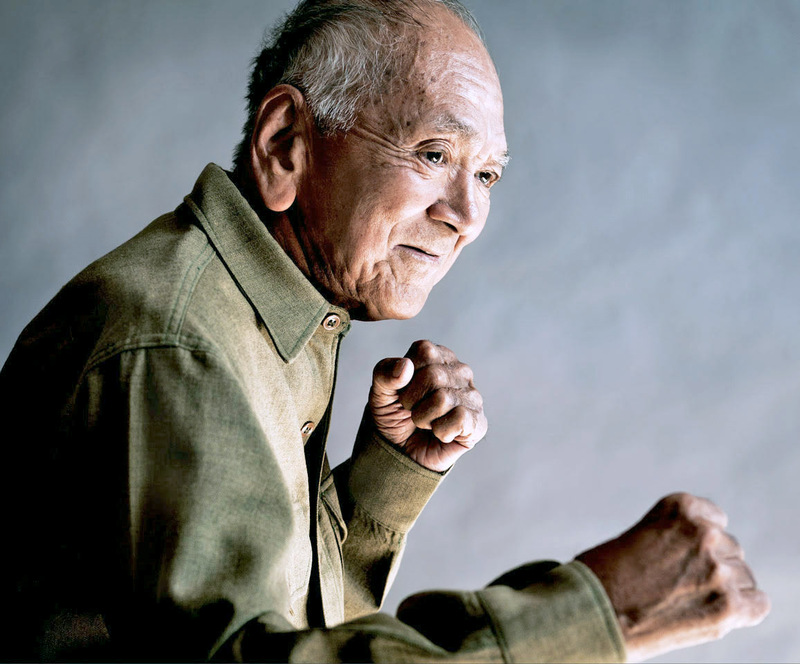 But Sato also realized he could have a more expansive, inclusive photographic vision that included Army uniforms, weapons and other props (like a camera for the late Susumu Ito, who famously brought an illicit 35mm Agfa with him as part of the 522nd Field Artillery Battalion) — and with other veterans who also embodied the “Go for Broke” spirit. As the years rolled by, Sato continued to photograph veterans, traveling outside of Los Angeles to Hawaii and Seattle, Wash.
“About five or six years ago, I realized I had a pretty strong collection. People always wanted me to show it in a book, but I didn’t know if I had the capability, time and funds to do that,” he said. He had about 80 or so portraits — but he needed some help. Enter Robert Horsting. Sato had known him for many years, thanks to Horsting’s involvement with GFBNEC’s Hanashi Oral History Program, which sought to record on video for posterity the recollections of Japanese American veterans of their experiences before they passed away. Sato continued to work on the portraits and writing the accompanying essays, with Horsting picking up much of the rest of the work of writing, along with Ken Mochizuki, Russell Shogo and Mariko Yukawa. The source material for those essays, according to Sato and Horsting, was a combination of the Hanashi interviews with the vets, as well as notes and audio recordings from the photo shoots themselves. While some vets were comfortable with being photographed, there were also those who were not, and it took Sato’s accumulated years of experience and powers of persuasion to get some vets to let their guards down and be photographed. 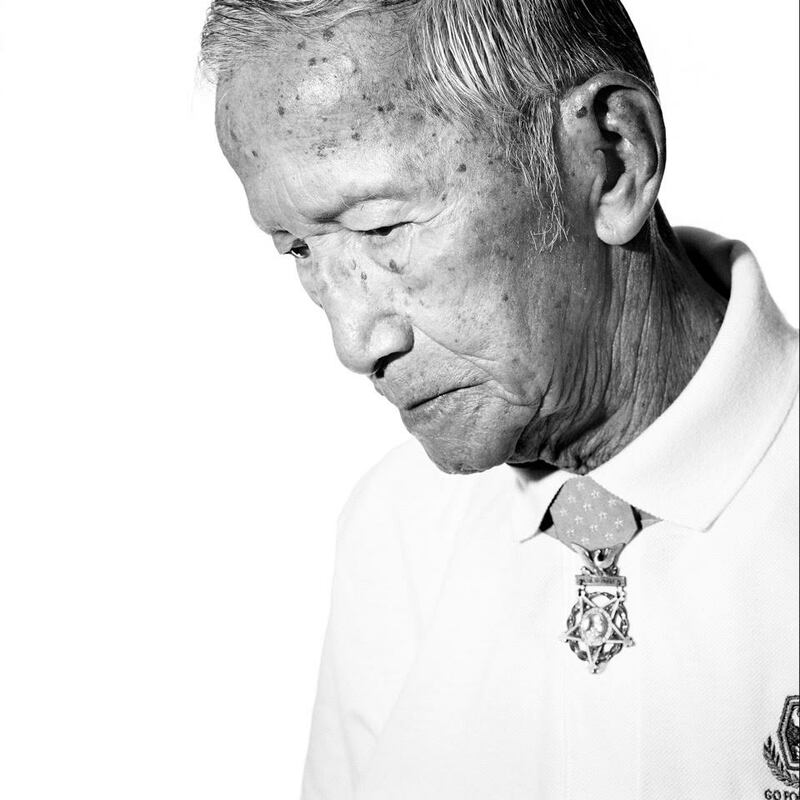 If there was one vet Sato regrets not being able to photograph, it was Daniel K. Inouye. Despite repeated efforts, the stars just never aligned due to the busy schedule of the late senator and Medal of Honor winner from Hawaii. “The Go for Broke Spirit” should have been completed in July, but when Sato went to China to conduct a press check at the Shanghai-based printer, he found many problems. Fortunately, Sato was able to get the project back on track, with the initial shipment of books arriving in early October — just in time for all-important holiday sales — and the end result is a moving, beautiful and delightful 184-page hardcover collection of 98 portraits that are a testament to Sato’s skill and expertise at bringing out a revealing, truly human side to each vet. Sato said there are about 40 unpublished portraits and some vets who are still alive who he would like to photograph for a second volume. It is, however, a race against the clock, with any still-living vets now in their 90s. Sato says he will also be in person to sell books Dec. 3 at the St. Francis Xavier Church Japanese Catholic Center’s (aka Maryknoll) festival. Interested parties can also learn more at Facebook.com/goforbrokespirit/. So, nearly 20 years after he began photographing his heroes, Sato is at the beginning stages of a new project: getting the book that collects those photos out to the public.